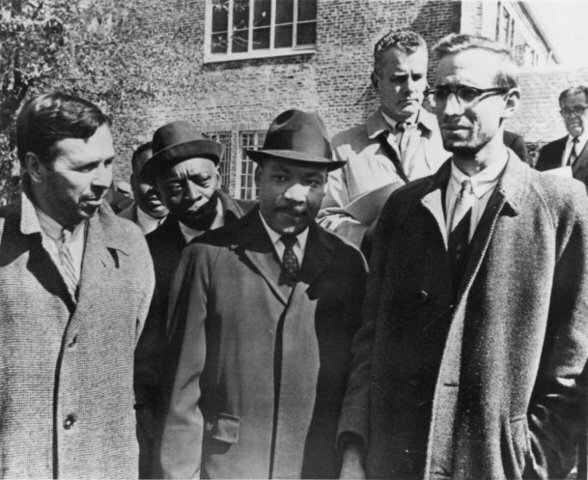 Special to the News Sentinel Gordon Gibson, right, with Dr. Martin Luther King Jr. after Gibson and a fellow Unitarian Universalist minister were released from jail in Selma, Ala., in 1965 after an African American voter registration drive. In 1965, UUs answered Rev. Martin Luther King’s appeal to clergy to “come to Selma.” In the 1990’s UUs embarked on an intentional path to become antiracist and multicultural as a denomination. In 2012-13, we chose as our common read The New Jim Crow: Mass Incarceration in the Age of Colorblindness by Michelle Alexander. Since then UUs have come together in solidarity teams, marched in Raleigh and Selma, officially supported Black Lives Matter nationally and congregationally, and partnered with Rev. Dr. William Barber for a strong interfaith movement. We have come to know and understand that racism is systemic. It’s an active part of our institutions, our culture and our law. Our history is steeped in racial conflict, slavery and genocide. Once, we applauded ourselves and our societal evolution thinking we’d eliminated or were well on our way to eliminating racism. However, we’ve discovered that it was never eliminated or even remotely so–but buried deep within the underground. Today’s current political climate has opened floodgates for racist attitudes to be expressed openly and violently. Racial intolerance has been given permission to take a prominent place in our relationships to each other. It’s here, in these pages and in the our hearts and of those we work with, that we will endeavor to return to the Journey of self and community awareness that works to build a dream of equity, dignity, harmony and respect.